One of the first things I noticed when I moved here to Ontario, was that if you drive around the countryside long enough, you will eventually pass a roadside zoo. They are everywhere! The “oooh animals!” part of me has been thinking about stopping in at a couple of these places to check them out. But another part of me is bothered: Are these places legit? Should I be encouraging mom and pop zoos? So my original thought was to throw the question out to my readers to see what you all think about these little zoos and animal collections — good or bad? Give them my money, or don’t? But a little research has made that decision for me. If you took the city of Tokyo and turned it upside down and shook it, you would be amazed at the animals that would fall out. It would pour more than cats and dogs I tell you. Boa constrictors, Komodo dragons, crocodiles, piranhas, ostriches, wolves, lynx, wallabies, manatees, porcupines, orang-utans, wild boar—that’s the sort of rainfall you could expect on your umbrella. You too can have a tiger! It turns out that here, while it is illegal to own a pit bull, it is perfectly legal to own a tiger, lion, camel, ostrich, chimpanzee, zebra, or any other exotic animal. You don’t need a license or any special training. You don’t have to register your animal and your site does not have to be pre-approved. You don’t need a security system, permission from your neighbors, to be financially secure, or to hold liability insurance. There are also no rules around buying, selling, or breeding these animals, so they are easy to come by – even the large cats and venomous reptiles. Tomorrow, I could go out and buy a tiger, a cobra, and a baboon and, if my local bylaws didn’t specifically prohibit them (they do), I could keep them in my yard just as long as I adhere to the province’s General Standards of Care. Of course, this requirement could never be enforced if I don’t have to tell anyone about my new pets. As a result, today thousands of exotic wild animals live in people’s homes and yards all over Ontario. Mid-size and large wild cats alone comprise between 250 and 500 animals. (Without a registry, it’s hard to count). These are just the house pets. In addition, thousands of animals are resident in the more than 60 zoos that are scattered across the province. Aside from the handful of large “official” zoos, most of these are of the roadside variety – regular folks charging people money to see their exotic animal collection. Animal protection? Yes, but is it enforced? So with all these animal protection laws, what’s the big deal with roadside zoos? As long as the animals are cared for, why not support them? First of all, not all the animals are well-cared for. Many of these zoos are run on a shoestring budget. Animals are frequently kept in barren, substandard cages and yards. The OSPCA has the right to inspect, on demand, any premises where wild animals are kept, but without any type of licensing or registry requirements, they don’t always know about wild pets and small zoos. Often they have to rely on visitors to report substandard conditions. In addition, because these zoos are short on money and caring for some of these animals is exceedingly time consuming, they often close up shop, creating a surplus of captive wild animals. The Ontario roadside zoo problem has become large enough that it has attracted the attention of Zoocheck Canada and the World SPCA. Zoocheck has been conducting ongoing reviews of Ontario roadside zoos and “sanctuaries” and has consistently drawn the same conclusions – most roadsides zoos are not healthy for animals or safe for people. Together the two organization published their most recent findings in Wild Neighbours: The Safety and Security of Ontario’s Wildlife in Captivity Facilities [pdf] which was based on a 2010 review of wild animal enclosure barriers and other recognized safety measures at six Ontario zoos. Lack of on-site supervision of zoo visitors. In the last 25 years, more than 50 wild animals have escaped from zoos or homes in Ontario. While it may seem cute to have a Japanese Macaque, a wallaby, or a Patagonian Cavy ramble through your yard, some escapees are not so welcome. In 1996, four tigers escaped from Elmvale zoo. Fortunately nobody was injured and the tigers were returned to their cages. In 2005 a tiger was found wandering the highway after escaping from Papanack Park Zoo in Wendover. In 2008 a black jaguar escaped from Guha’s Lions & Tigers, killed the family dog, and was shot and killed by OPP. This past year, a wolf escaped from Jungle Cat World in Orono and was shot dead by a local farmer. And finally (and this is my pet peeve), many exotic animal owners have an exaggerated sense of safety with their own animals. Despite the many cases where wild animals have attacked their owners or visitors, most wildlife owners honestly do not believe their animals will attack them, or anyone else. Mr. Guha himself does not appear to be well. His vision seemed to be impaired and he was walking with a cane. During the tour his physiotherapist arrived and joined us. Under normal circumstances the health of the zoo operator is not necessarily an issue, but Mr. Guha informed us that he still enters the lion cages. Entering cages housing big cats is a questionable and usually risky practice at the best of times. It may seem like the now-famous horrific attack on Charla Nash by her friend’s chimpanzee was an freak occurrence, but attacks and maulings by pet exotic animals occurs more frequently than people realize. Many of these attacks happen because the owners and handlers treat the animals as though they are domestic pets. In January 2010 Norman Buwalda of Southwold, Ontario was killed by his pet Siberian tiger, a 650 lb animal he kept in a barn on his property. This was the second attack by one of Buwalda’s six large cats. A 350 lb animal attacked a 10 year old boy in 2004, injuring him severely. The boy was taking pictures of the tiger while Buwalda held it on a leash. The tiger lunged and the man was unable to stop it. In 2008, a lion from Bowmanville Zoo aggressively knocked down a woman during a photo shoot. While the handler maintains that the animal was being playful, the video makes it clear, the man had no control over a 600lb lion on a leash. The animal broke four of the woman’s ribs. Other videos of Bowmanville zoo include scenes where a deer attacked a worker after she approached too closely while it was giving birth; handlers and a reporter are petting a tiger; and a keeper well within reach of a lion’s claws while she prepares to feed it. Today Ontario’s lack of legislation around private ownership of exotic non-native animals is putting both animals and humans in jeopardy. The province is sadly behind in regulating the practice. It’s time to get some rules in place. Until then, I’m not comfortable supporting these ventures so won’t be dropping by any of the local establishments to see their animal collections. I hope that my Ontario friends will consider doing likewise. DO NOT visit roadside zoos or animal displays. If you visit a roadside zoo to see the conditions firsthand, take photographs/video and make notes. If you see an animal in distress or not housed for in accordance with the prescribed standards please contact the Ontario SPCA immediately. Let Zoocheck know of any suspected or known violations affecting the welfare of zoo animals or the public’s safety at zoos. Support efforts to legislate [pdf] regulations around the keeping of exotic non-native wildlife in Ontario. Protect yourself: do not put yourself (or your children) within reach of wild animals (especially large predators), no matter how tame they seem. Lickety Split Ranch and Zoo. As always, a well documented, written, and informative article on an emotional topic near to the heart of many. I support your conclusions/recommendations. Meanwhile I will continue to reside where I can own my own pit bull, Burmese and Rock pythons – and crosses, as well as a host of other non-native, invasive and really NASTY species. It’s a sick world. This is an excellent article on a topic obviously dealing with public safety and treatment of animals. I had not been aware of the incidents at Bowmanville. The displays there I had found to be much improved from what they had been thirty years ago (atrocious then). But the little stage shows of performing animals had bothered me when I saw them three years ago. The potential for problems is obvious, and as you point out, not just theoretical. It is unfortunate that nothing will be done to deal with these conditions until another incident — it would likely have to be severe and involve loss of life — but that’s the way politicians and bureaucrats work. Definitely food for thought. Thanks for a great blog. Typical do gooders restricting the rights a freedoms of others with fear mongering. The animal no one should own is the horse as it kills many hundreds of people annually and maims many thousands in north America. so why not go after horse owners. aLot of these people that own horses don’t even ride them. Sometimes with shoddy fences allowing there 1200 lb animals to run amok out into traffic. 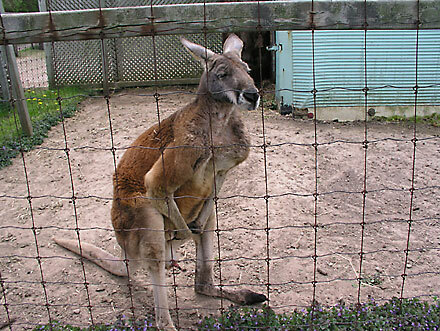 Lets talk about Australians and there kangaroos. A lucrative business in Australia is to shoot kangaroos by jack lighting them. In one night a diligent jack lighter can bag about fifty of them and sell the carcasses for dog food. So I can see why they would be upset about the one in Canada being in a small cage They would probably prefer to see it in a can. Because horses are dangerous, it is safe and should be permissible to keep tigers as pets? Because Australians hunt kangaroos, it is acceptable to keep a kangaroo in squalid conditions without proper food, water, and care until it succumbs to disease and starvation some months or years later? What I am saying is if you are going to restrict ownership of animals. Why not go after the most dangerous first which is horses by a long shot and I am not saying that is ok to abuse or starve any animal as you claim this particular kangaroo was. Please don’t attempt to follow me but rather try and follow the thousands of beloved kangaroo’s that are not killed cleanly but are rather wounded to die a lingering death or torn apart by dingo’s or live out the rest of their miserable life with a crippling injury or handicap caused by a poorly placed bullet. So if Australians are so shocked and appalled by what some Canadian did to their nation symbolic animal tell them to go and take a look what’s happing in their own back yard hidden away like some deformed step child. These are the lucky ones that were killed clean they don’t show the 5%-10% that die a lingering death or are mutilated by a poor shot. Why do i have the feeling that some of the compassionate posters here are cat owners .Cats may kill up to 3.7 billion birds and 20.7 billion mammals in the United States alone each year, a new study has found. That means predatory felines are likely the leading human-linked cause of death for birds and mammals, surpassing habitat destruction, collisions with structures such as buildings, and pesticide poisoning, reports an article published Tuesday in the journal Nature Communications. “The magnitude of wildlife mortality caused by cats that we report here far exceeds all prior estimates,” said the paper co-authored by three U.S. scientists. The researchers warned that very large numbers of birds and mammals are likely being killed “in all parts of the world where free-ranging cats occur,” not just the United States. According to the paper, cats were previously thought to be a “negligible” cause of mortality for birds and mammals compared to other human-linked threats, and that is one of the reasons why policies to deal with stray cats often involve neutering them and then returning them to their hunting grounds. The study, led by Scott Loss at the Migratory Bird Center of the Smithsonian Conservation Biology Institute at the National Zoological Park in Washington, D.C., combined and analyzed data from as many other studies as the researchers could find about cats preying on birds and mammals. Although the estimates of the feral cat population and the average kills per cat varied widely among the studies, Loss and his colleagues were able to say that U.S. cats fell 1.4 to 3.7 billion birds a year — a huge number considering that the entire population of North American land birds is estimated to be just 10 to 20 billion. As for mammals, cats were estimated to kill 6.9 to 20.7 billion per year. For comparison, the human population worldwide is seven billion. The study found that a large majority of the birds and mammals killed by cats were native species. Cats without owners are blamed for most of the deaths. There are about 30 million to 80 million feral cats in the U.S., each of which can kill upwards of 200 mammals a year alone, the study reported. However, pet cats were far from innocent, causing 258 million to 1.5 billion of the bird deaths and 571 million to 2.5 billion of the mammal deaths. The paper advocated taking measures such as limiting or preventing cats’ access to the outdoors. We just have to look in our own backyard to see animal abuse. Abuse, torture and ignorance has become a disease of disregard for all animals. You can’t expect to take a wild animal, put it in a small cage or enclosure and expect it to act in any other way but crazy over time and lash out in frustration if they don’t get the proper stimulation and release from the pressures of this type of life. I know longer will go to a zoo, an aquarium, a circus where wild animals are used and abused. I am guilty of owning a parrot that was not wild caught, but still very wild only a few generaltions from wild. I will never get a baby parrot again. I will however, adopt older parrots, or parrots that were given up due to death or illness or help abused and neglected parrots. Breeding and selling these incredable animals with so much intelligence is shameful and the people that support the wild caught trade of parrots or any other wild animal should be treated the exact same way as they treated those animals. Anyway you get my point I’m sure. How do these animals especially the large ones get into this country in the first place? So I guess we need to pressure the govenments to crack down on this. But that being said, they don’t even take responsibility for the mistreated animals that are killed for our food. I don’t have any problem with any person from any country pointing out any type of abuse of any animal. There is an organization in Australia that is indeed making headway on many animal cruelty issues. I myself sign many petitions bringing attention to people and governments all over the world to change the cruel treatment of animals. Believe me there are so many, my heart breaks everyday. I want to be a voice for the helpless, the weak and the abused. Human or animal. Almost all parrots and on the watch list or endangered list. Most turtles the same. Many species of fish and seafood the same. The coral reef that supports life in the ocean is disappearing, honey bees are seriously declining, Elephants endangered, black rhino’s extinct, leopards. Look in your own back yard, do you ever see a butterfly, toads, leopard frogs, honey bees. At the rate we throw garbage out everywhere but in a garbage can, cigarettes that cause fires, and pollute our rivers with sewage, oceans with oil etc. I think I am glad that I don’t have children or grandchildren because the world won’t be a very nice place to live. As for horses killing people, I doubt the number is that high considering how many there are. However, the number of horses killed by humans is far greater. We kill them everyday when they run a race and break their leg or come up lame and have to killed. The chuckwagon races are another example. I could go on for ever, but my point is made Eric and others who think the same way you do. Yes you are right to ignore hard data and instead come up with I doubt if that’s true.Good research! As far as humans killing horses as u say in rodeo’s and horse racing that is true. So im guessing you want horse ownership banned as being unfair to the horses. i see people riding horses and horse pulling wagons and packing gear how unfair! all horses should be set free and i might add good luck to them. Regulations to protect our animals in zoos, are sadly lacking in the province of Ontario. In fact, Ontario is the only province that does not require individuals or zoos to have a license to own an exotic animal. Please sign and share this petition so we can take steps to correct this. Why do we as humans need any animals on this planet. Wild tigers and lions kill many hundreds of people annually.While captive ones kill only a couple world wide. Venomous snakes kill over 100 thousand people a year in the “wild” Wild sharks kill at least 5 people a year and crocodiles kill over 300. Man kind should be doing its best to eradicate all wild animals and zoo animals as at the very least they are completing against us for food and at best provide some form of sic entertainment. The world would be better off without animals and humans could be 100 percent vegetarian.That way the earth could support 20 billion of us comfortably. With modern computers and books animals could be viewed virtually with out danger. Let us be the last generation to put up with these risks to our lives.If every person did his best to kill every animal he or she saw I am quite sure this could be accomplished in a matter of a few short years. Oh one more thought kill domestic cats last cause they doing a good job of wiping out the wild bird population at the rate of several billion a year. I stand correct the horse is not the most dangers animal to humans in north america. Here is some interesting facts that disease past on by domestic felines infect 1 million people in the USA and is fatal to at least 750. Not to mention the billion s of wild birds they kill. The fact that cat ownership is legal is insane! Cats should be exterminated on site in self defense! In the United States, prevalence of Toxoplasmosis may be declining, but approximately 14% of the individuals are seropositive by the age of 40 years, with one million new infections each year, resulting in approximately 20,000 cases of retinal infection and 750 deaths, making it the second most common cause of deaths related to food-borne diseases. Toxoplasmosis must complete its life cycle in a feline.